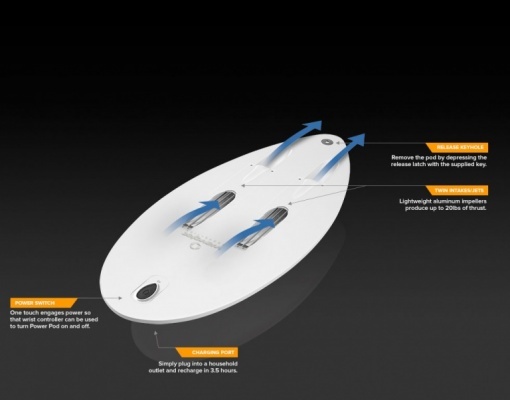 The electric sup wavejet is developed in South Africa and the engine originally was designed for electric Waveboards. A classic surfboard which would help you to catch the waves. Today the engine is offered for SUP, rescue surfboards and kayaks as well. The twin jet engine which is called Power Pod is attached to the board. It can be removed for charging, but needs a special board in order to fit. 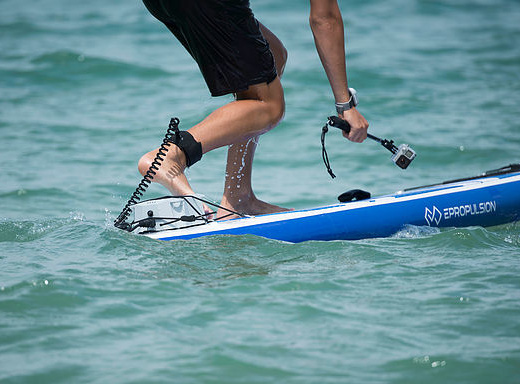 Next to the board with the Power Pod the electric SUP comes with a wristband controller which controls the 2 jet engines. 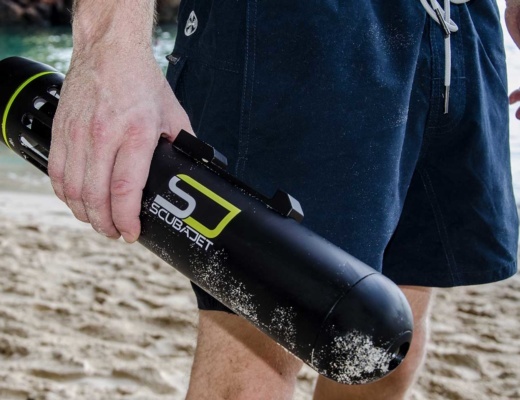 The so called Seathooth controller also indicates the batter power of the Power Pod and shuts down the engine if about 10 feet or more away from the remote control. In order to charge your wristband controller and the Power Pod the electric SUP comes with a battery charger which charges the board within 3-4 hours. 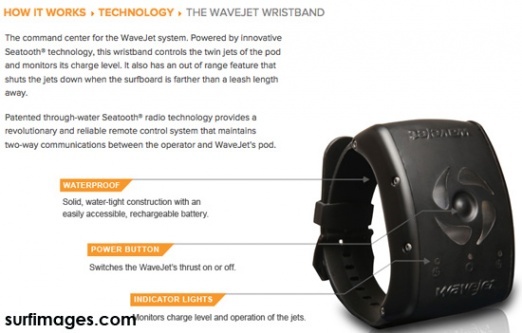 Wavejet claims that the battery should last for about 45 minutes continues run time. The board comes also with a toolkit and manual. Depending on the size of the board it sells between 3,800 to 4,000 USD. The board without the Power Pod sells around 1,000 to 1,200 USD. So a Power Pod is about 2,800 USD on its own. If you don’t care about money you can buy to 2 Pods in order to double the range. 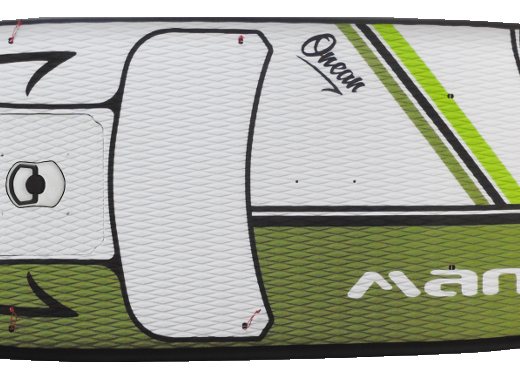 The board weights 18.5 lbs or 8.4 kg and the size of the 8’3 shape (252 cm long) is 32 inches (81.3 cm) wide, 4.3 inches (11 cm) thick. The Power Pod itself has a weight of 17 lbs or 7.8 kg. 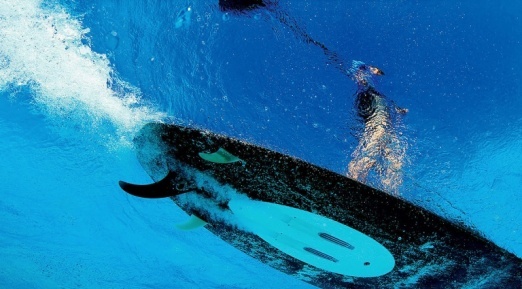 Can can compare the electric SUP Wavejet with other E-SUPs in our electric SUP comparison. We are planing to get hold of one of the boards to do a full review.